Grilled Salmon, Dill Sauce, Salad, Thyme for Cooking simple gourmet summer. Sprinkle 1 tbs dill evenly over salmon. Sprinkle salt on top of dill. Cook on barbecue grill 5 - 7 minutes per side, depending on thickness. OR put on baking sheet and roast in 400 F oven for 15 - 20 minutes, depending on thickness. Salmon should flake easily with fork when done but it's okay to have it still a bit pink in the center. Remove and with a fork or table knife gently scrape the salt and dill off of the salmon. Mix yogurt, mayonnaise, garlic, 3 tsp vinegar and remaining 1 tbs dill. Add olive oil and whisk until combined. Put 1 tbs Dill Sauce in another small bowl. Add 2 tsp white Balsamic vinegar, 1/2 tsp mustard and whisk well. Slowly whisk in 1 tbs olive oil. Prepare lettuce and arrange on plates. Lay salmon next to lettuce. 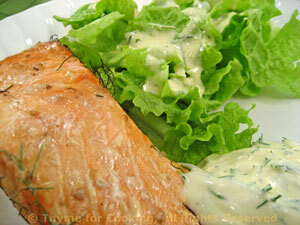 Spoon a bit of Dill Sauce next to the salmon and drizzle the dressing on the lettuce. Serve.